One word on making perfect pork pork chops: brine. I had never brined pork chops until recently and let me tell you, it makes a huge difference. It’s totally worth the extra time and effort (very little effort though, really) because it makes the pork chops so much more flavorful and tender. If you’ve never brined pork chops before, I highly recommend giving it a go. It’s so easy to do and adds a great punch of flavor. If you try it, let me know what you think! Meanwhile, hope everyone had a happy weekend and enjoyed rolling in the official start of summer. Hope all you dads had a great Father’s Day too! In a mixing bowl, combine everything, but the pork chops. Stir well, until salt and honey is dissolved. Place pork chops in a large zip lock bag and pour brine over top. Seal bag and gently slosh the mixture around to coat the chops. Place in fridge and let sit overnight or up to 24 hours. Move the mixture around from time-to-time to keep the chops well covered in brine. Remove the pork chops from the fridge 30 minutes before cooking. Discard the brine and rinse pork chops in cold water and pat dry with paper towels. Turn on the grill and allow to heat up to medium. Place the chops over direct heat and sear for 2 minutes each side. Then, move to indirect heat, cover and cook for 5-7 minutes each side. 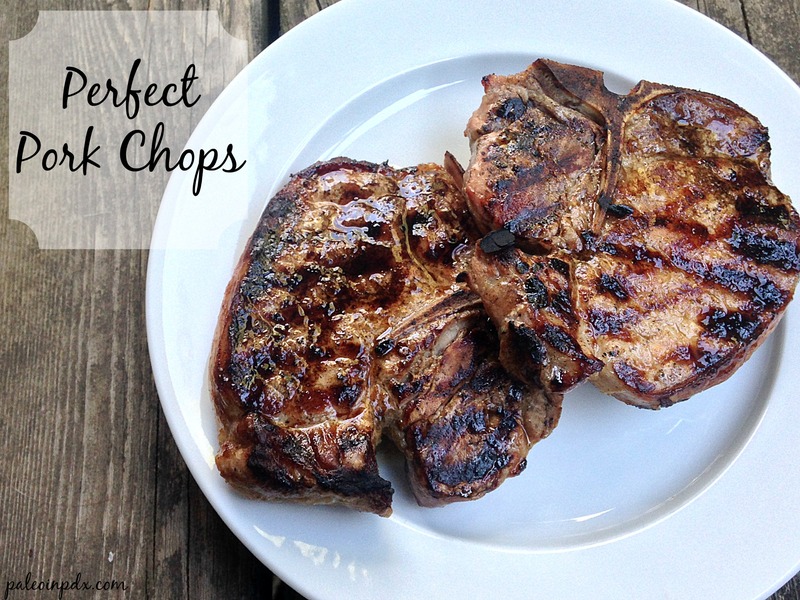 Let chops rest 10 minutes after coming off the grill. This is something I really need to try–I know it works well for turkey but for some reason I forget about doing it woth other meats. Thanks for the post–it’s on my radar for this weekend! I hear ya, Paula. I do it with turkey for Thanksgiving, so I’m not sure why I never did it before with other meats! Hope you enjoy it! This is my new favorite way to do chops!! We just finished dinner and my husband thought they were excellent too. So glad you posted this! Just to make sure, after the pork chops sit for 24 hours in the brine, I actually wash it all off and then pay down with a paper towel? Will that not defeat the purpose of letting it marinade overnight? Yes, that is what you do and no, it does not defeat the purpose. The brine is really salty and you need to rinse it off after the 24 hours. It tenderizes the meat and or course, gives flavor. Have you ever wet-brined a turkey? It’s the same process. Also, brine is different than marinade — there’s no oil and it’s saltier. Brining is a longer process too. Anyway, hope that helps clarify and if you try the pork chops, enjoy! They’re very tasty! I’ve always done it for longer, but I think eight would still be fine. I wouldn’t recommend any less than that though. If you can let it sit a bit longer, I recommend doing so. Can you grill it indoors and put it in the oven for the last part? Sure, I don’t see why not. I’ve never done it that way, so I’m not sure on the timing though. Hope it works well!